Tuf-R bags are made from a special blend that allows a lighter gauge Tuf-R bag to have the same strength as a heavier gauge LDPE bag of the same type. 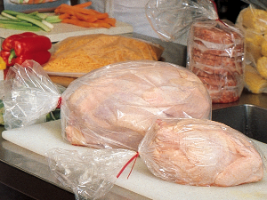 Open-ended bags can be heat sealed, taped shut or closed with a bag tie. These bags can be used for to package and protect virtually any type of product and meet FDA requirements for food contact. Tuf-R bags are made from a special blend that allows a lighter gauge Tuf-R bag to have the same strength as a heavier gauge LDPE bag of the same type. Open-ended bags can be heat sealed, taped shut or closed with a bag tie. These bags can be used for to package and protect virtually any type of product and meet FDA requirements for food contact. These bags are not autoclaveable nor are they intended to be leak proof.